LOOE KEY, Florida Keys â€” â€œReefpublicansâ€ and â€œDemocrabsâ€ are to congregate in the Lower Florida Keys Saturday, July 12, when the 24th annual Underwater Music Festival puts an undersea spin on the upcoming 2008 presidential elections. 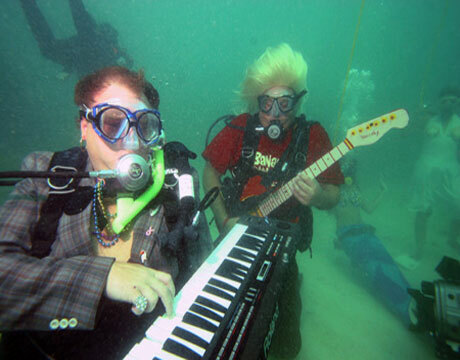 The quirky underwater concert takes place at Looe Key Reef, an area of the Florida Keys National Marine Sanctuary located approximately six miles south of Big Pine Key. Each year, the subsea songfest draws as many as 600 divers and snorkelers to explore the colorful diversity of marine life that characterizes North Americaâ€™s only living coral barrier reef. The 2008 festival is to salute Novemberâ€™s â€œeel-ectionsâ€ with underwater appearances by divers costumed as â€œBarackuda Obama,â€ â€œHillary Clintunaâ€ and â€œJohn McClamâ€ among other political notables. Set for 10 a.m. to 2 p.m., the marine musical event is staged by Keys radio station WWUS 104.1 FM, locally called U.S. 1. Music is broadcast underwater via Lubell Laboratory speakers suspended beneath boats positioned at the reef, and the playlist typically ranges from humpback whale songs to marine-themed ditties such as the Beatlesâ€™ â€œYellow Submarineâ€ and Jimmy Buffettâ€™s â€œA Pirate Looks at 40.â€ â€œWe also feature the work of local Keys musicians, who often have a unique vision of life in the Keys and on the water,â€ said event founder and organizer Bill Becker of U.S. 1. â€œThis year, of course, weâ€™re planning to add contemporary musical spoofs of the political process.â€ Participants might even catch the scuba-diving â€œpresidential hopefulsâ€ tooting their own horns â€” pretending to play underwater musical instruments like a trom-bonefish and sax-eel-phone sculpted by Florida Keys artist August Powers. While election â€œafishionadosâ€ are encouraged to enjoy the bipartisan party at Looe Key Reef, the concert also has a serious focus: promoting preservation of the Florida Keysâ€™ unique coral reef ecosystem. The musical broadcast incorporates diver awareness announcements, prepared by Florida Keys National Marine Sanctuary officials, offering tips on how people can enjoy the ocean while minimizing the impact on the reef and overall marine environment. Divers and snorkelers eager to participate in the 2008 Underwater Music Festival can reserve space aboard boats run by Lower Keys dive operators. Visitors and residents with their own boats can launch from public ramps throughout the area.